Rabbits will line their nests with their own fur. Two common situations may result in having a pregnant rabbit: if you recently acquired a pet rabbit from an environment where it was housed with a male rabbit and if you have both an intact male and an intact female rabbit who spend time together. Either situation could result in welcoming baby rabbits into this world, and you'll need to know what to expect next. Rabbits who have not been spayed or neutered are referred to as being intact and once sexually mature, can produce offspring. For smaller breeds, sexual maturity occurs as young as 3.5 months of age. If your intact female rabbit was with an intact male rabbit and they are both over the age of 3.5 months, you'll want to monitor your rabbit for signs of pregnancy. Like most mammals, a female rabbit's belly will get larger as her babies grow inside throughout the pregnancy, so this is the most obvious sign of a pregnant rabbit. Aside from the weight gain, pregnant rabbits will begin to eat more, and most will also seem extra cranky or moody. If your rabbit is usually pretty unfriendly though, it may be difficult to tell if it's pregnant based solely on a mood swing. After about 10-12 days post-breeding, you'll be able to feel multiple marble-sized bumps inside the rabbit's belly. These small bumps are the baby bunnies and will be just big enough to gently feel at this time. They will continue to grow inside the rabbit for another couple of weeks until the rabbit gives birth about a month after breeding. If a pregnant rabbit has gone more than 35 days after breeding and still has not given birth, a veterinarian will need to be contacted as soon as possible to either induce labor or perform surgery to remove the babies. A pregnant rabbit will exhibit nesting behavior about a week before giving birth. The most obvious sign that a rabbit is beginning to nest is if she's piling up bedding or digging into a corner of the enclosure. Usually, a rabbit will take hay or items it can carry in its mouth, or push blankets or loose bedding together to make a comfortable space to give birth. A nesting rabbit may also pull its fur out to line the nest, which can be alarming to owners who don't know to expect this. If your rabbit is nesting, it will most likely give birth within a week and if your rabbit begins to pull its fur out, anticipate that the babies will be born within the next day or two. 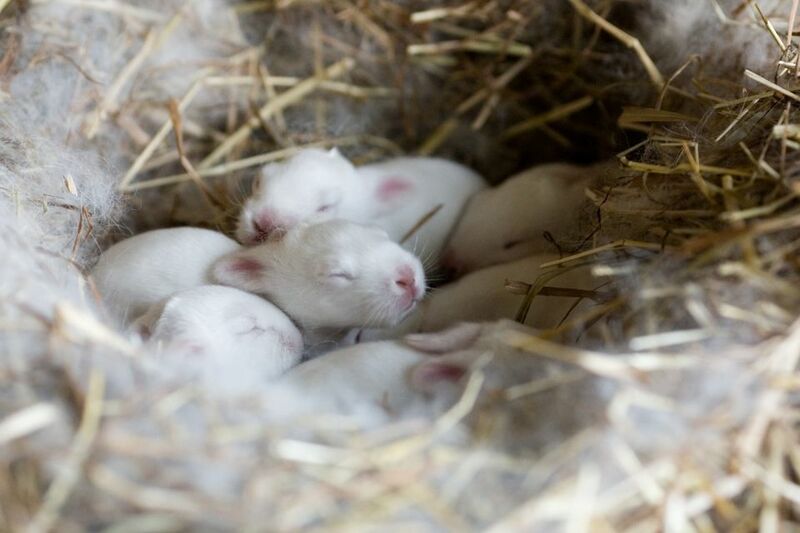 Most rabbits give birth at night, so be prepared to wake up to a litter of rabbits. In addition to the usual food and water bowls, a pregnant rabbit will need space for its nest and enough room to accommodate all the babies it gives birth to. Rabbits can have up to 14 babies in a litter so you should be prepared to have space for a lot of rabbits, especially if you don't have homes lined up for them to go to once they are weaned. An easy-to-clean nest box option is a cat litter pan filled with hay or bedding. This can be cleaned as needed if your rabbit uses it as a bathroom before the babies being born and also after the babies leave the nest. Some people use other plastic containers with a side cut out of it so the rabbit can quickly get in and out, while others make wooden boxes, but these are not as easy to clean. The nest box should be placed within the rabbit's enclosure. A large cage or exercise pen are good options for housing a pregnant rabbit. These will ensure that the pregnant rabbit uses the nesting box you have provided and it will make it easier for you to monitor the babies that are born if they are all in this one area. Pregnant and nursing rabbits will consume more food since they are feeding both themselves and their growing babies. Because of this, the number of fresh vegetables that are offered should be increased, and alfalfa hay should be provided at all times. Make a gradual switch from the grass hays that an adult rabbit usually eats to the alfalfa to avoid any soft stools. You can do this by gradually mixing the two hays until you've completely switched over. Freshwater, ideally in a bowl, should also be offered as usual. Most baby rabbits will require no assistance from a human. Baby rabbits will nurse from their mothers once a day, usually between midnight and 5:00 a.m., for three to four weeks until they are weaned. You can handle newborn baby bunnies if you are concerned whether or not they are being cared for. Baby bunnies should gain about 1/4 ounce per day if they are being fed appropriately and a round belly is evidence of a meal if you check on them early in the morning. In the unlikely event that you need to intervene and help a domestic baby rabbit, the special formula should be purchased to use for bottle feeding. You should attempt to reintroduce the baby to the mother after a few days of bottle feeding since some new mothers do not have adequate milk production until a few days after giving birth. Some rabbits experience a false pregnancy where their body thinks it's pregnant, despite that not being the case. False pregnancy will cause a rabbit to exhibit nesting behavior and act moody, just like a real pregnant rabbit would experience. False pregnancy behaviors usually only last about two to three weeks so this, in addition to the lack of growing babies inside the rabbit, is the primary way to tell whether or not your rabbit is experiencing a real pregnancy. Aside from keeping an intact female rabbit completely separate from an intact male rabbit at all times, the best way to prevent a rabbit from becoming pregnant is to spay it. Spaying a rabbit will remove the uterus and ovaries that a rabbit needs to have babies, as well as eliminating or decreasing the chances of it developing several types of cancers later in life. Surgery to spay a rabbit does not happen without risks of course, but you should discuss this with your veterinarian.